Only Japanese are capable of such a crazy thing - continue fighting for thirty years after the end of the war because his superior did not come to relieve him from the mission. 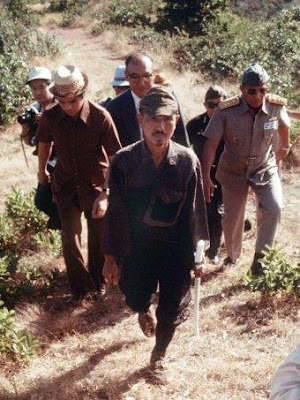 Hiroo Onoda, a Japanese soldier who fought in World War II and did not give up until the mid-1970s. He is well-known among the Japanese as a war hero and a symbol of "never give up." Onoda was sent to the Lubang Island, western Philippines, in December 1944 at age 22.His mission is to get into the enemy lines, carry out surveillance operations and survive independently. One of the last orders of his superior commander Yoshimi Taniguchi was destroying Lubang Air Base in a guerrilla mission, and no surrender, no suicide.
" It could take three years, could take five, if that is the case, live on coconut! In no circumstances, you are allowed to suicide. Whatever happens, we will return for you." Like a good soldier, he followed orders and lived by these orders, but Taniguchi did not return. When World War II came to an end, Onoda and three other soldiers (Yuichi Akatsu, Shimada, Kozuka) get isolated in Lubang. While on the island of Lubang, Onoda monitored the military installations and participated in sporadic clashes with local residents. The food never seemed to be a big problem for him. For about 30 years, he collects food from the jungle or stole from farmers in the area. They were so well trained that they ignored several attempts made to ensure their surrender. When they found a leaflet which read the war was over, they thought it was American propaganda. Toward the end of 1945, pamphlets with a surrender order from General Tomoyuki Yamashita of the Fourteenth Area Army were dropped from aircraft. This time they consider the pamphlet seriously, trying to determine whether it was "genuine" or not. Unfortunately, the pamphlets were full of errors, so they concluded that it was a plot hatched by the Americans. Their existence was first known in the fifties when Yuichi Akatsu, decided to return to Japan and surrendered to Filipino forces in 1950. Consequently, leaflets, letters and family pictures were dropped by aircraft announcing that the war was long over, and the imperial army was defeated, but the soldiers refused to believe it. Four years later, May 7, 1954, Shimada was shot dead by a patrol party. 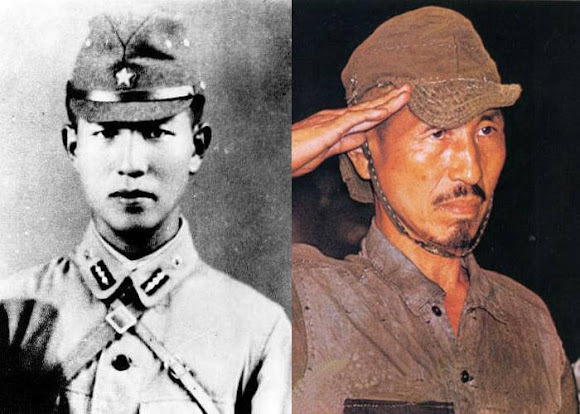 Tokyo and Manila tried to contact the other two Japanese soldiers for years until officially declared dead in 1959. However, they are waiting patiently for reinforcements. In 1972, Onoda lost his last man. After 27 years of heroic resistance, Kozuka, 51, is shot dead by local police. The confrontation made the Japanese newspapers; Onoda is still alive! Tokyo then decided to send members of his own family to try to convince him to lay down his arms. All efforts were in vain and lost track again until he was spotted by the Japanese explorer, Norio Suzuki in March 1974. They had a long talk and became friends. Being a devout imperial soldier, Onoda could not accept that Japan had lost the war. Onoda recognized that the war was over, but he insisted that the orders still standing, it would not go until his commanding officer rescind the original order. 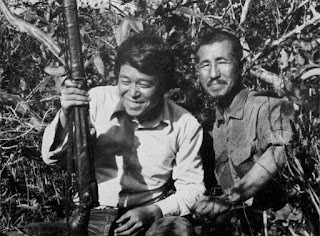 Suzuki took the challenge, returns to Japan with photographs as proof of his encounter with Hiroo Onoda. With the help of the authorities, he located Onoda's commanding officer, Major Yoshimi Taniguchi, who become a bookseller after the war. Finally, in March 1974 his former commander traveled to the Lubang to personally revoke the original order. Onoda is completely struck by the news. "So it's true, we lost the war! How could they be so incapable?" he thinks. Mr. Onoda honored the Japanese flag and surrendered his sword, turned over his rifle, ammunition and several hand grenades. Even he had killed 30 peasants and police the Philippine government granted clemency. In 1984, he established “Onoda Shizen Juku” to train young Japanese in survival and camping skills he had acquired during the decades he spent in the jungles of Lubang. He died on 16 January 2014 in Tokyo. Onoda wrote an autobiography “No Surrender: My Thirty Year War,” shortly after his return. 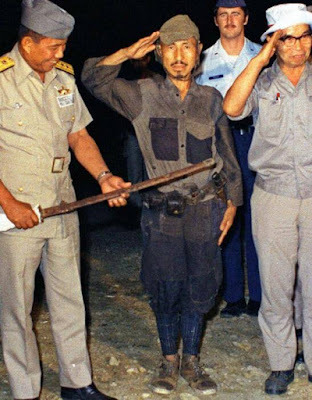 In 1996 Hiroo Onoda revisited Lubang Island and donated $10,000 to the local school. Norio Suzuki died in November 1986 in an avalanche while searching for the yeti.